Slow cooker creme brulee for two, made in the crockpot and so easy! Can I interest you in cool, creamy (and crunchy!) 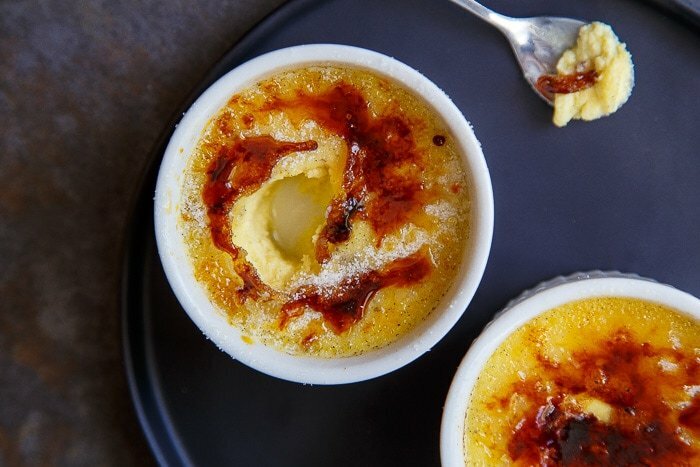 creme brûlée that doesn’t require the oven? Of course I can. Do you own a crock pot? I’ve been looking for ways to use the slow cooker on Dessert for Two for years. Even though I have the smallest model of crock pot that makes meals for two, most of you do not. So I just felt silly developing recipes for you in it. But using a crockpot to make mini desserts for two? OH YEAH. Game on! I basically took my standard creme brûlée for two recipe, subbed in a vanilla bean for charm, and baked them in a water bath in my slow cooker. This is the small 4-quart slow cooker that I use and love in my small household. 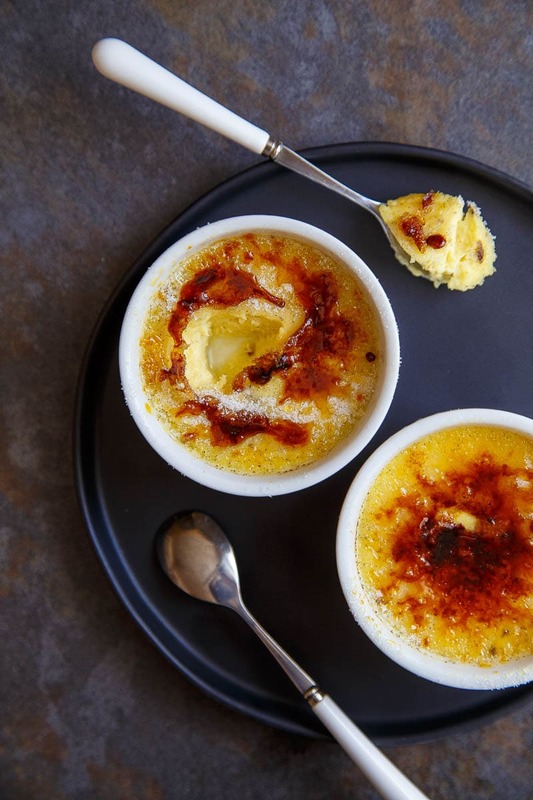 Slow cooker creme brûlée only takes 5 minutes of prep, and 2 hours to cook this way! Consider my mind blown. The only persnickety thing with this recipe is the foil ring. You can’t set the ramekin directly on the surface. So, take a sheet of foil, about 12″ long or so, roll it up into a worm, and then curl it into a ring. Set each ramekin on one and you’re good to go. I love this recipe for slow cooker creme brulee, because it basically takes care of itself. It’s a big reward for such little effort. 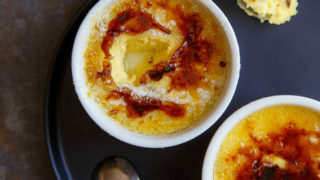 Plus, when creme brûlée comes out of the oven, sometimes you have to play the guessing game–is the wiggle in the middle the right amount of wiggle? (That sounds like a question I ask myself every morning when I’m getting dressed). The slow cooker cooks the creme brûlée more evenly than the oven–the entire custard will be set when its done. I love that. Since this recipe uses 3 egg yolks, be sure to check out my recipes to use leftover egg whites section! Combine the egg yolks, whipping cream and 1/4 cup of the sugar in a bowl. Whisk to combine. Using a dull knife, scrape the seeds out of the vanilla bean and add it to the cream mixture. It should be about 1/8 teaspoon of vanilla bean seeds. You can substitute extra, if you prefer. Whisk the mixture together very well. Meanwhile, take 2 12" long pieces of foil and roll them up into a snake shape. Curl it into a circle, pinching the ends together. Place in the bottom of your slow cooker. Repeat with the other piece of foil. Place each ramekin on top of each foil ring. Pour boiling water in the slow cooker (carefully! Don't splash water on the custards) until the water reaches up about 1/3 of the way on the ramekins. Turn the slow cooker to LOW and cook for 2 to 2 1/2 hours. When done, the custard should be set--poke it with a knife to be sure. Cover and chill the custards at least 6 hours. Before serving, sprinkle the remaining 2 teaspoons sugar evenly over both custards and torch with a culinary torch until brown. A small batch of soft pretzels. Like, two of ’em. This is so darn creative. LOVE! Creme brulee in the slow cooker – brilliant!! Creme brûlée was the first “gourmet” dessert I fell in love with when I was a little kid, I then became obsessed with making it. I haven’t made it in eons, and I have no idea why. I am seriously obsessed with the fact that you made this in the slow cooker! Do you add additional sugar for the top crust? i am also curious about this – it seems like they’d still need to go under the broiler to get the sugar crust, since the crock pot will be steamy. Yes, beth, they do. I updated the instructions accordingly. Sorry for any confusion! what size ramekin are you using?? Regular 4-ounce ramekin. Sorry for the confusion! Whaaaaaaaaat? My mind is slightly blown. What a great idea! I love making crème brulee but I swear my little guys take at least twice the recommended amount of baking time to lose their wiggle. I like this set and it and forget it technique! You’re my hero for making creme brulee in the slow cooker. No more checking the oven 100 times to see if the wiggle is gone from the middle – ha! Great idea! Questions: what size are the ramekins? Is that a 3qt crockpot? If so, and I have a 6qt, can I double the recipe, and does the cooking time change? This is our moms favorite dessert! I’m looking forward to treating them!! Oh, my goodness! I won’t have to struggle to get the big heavy pan full of scalding water out of the oven without spilling it on me or into the creme brûlée. What a great idea! How do you get the top crust? Do you sugar and torch the top when it’s finished? You could use a Mason jar lid to elevate your ramekin for more stability. Hi, Sally: I have to once again thank you for sharing such a wonderful and creative way to have creme brulee the easy way – and for two. You are right about the size of the cooker – I didnt realize mine was as small as it was and had to buy a bit of a scaffold of kitchen implements to make it work. I also made your simple caramel sauce – so much better and easier than any I have ever tried – couldnt put m;y ramekins in the broiler and left my propane torch on a move so I used the caramel on the creme brulee. So good !! Still making your apple pie with the lattice (I finally understood how to plait) and now I have the best caramel sauce for it. Thanks so much! All good things with your books. Christina this is brilliant!! There are not many things I haven’t at least considered making in the slow cooker but I never even thought to use it for Creme Brûlée!! I can tell you I’m going to try this out soon, for sure!! GURL. I only ever get creme brulee at restaurants because who got time for that? This is a game changer and now I blame you for my weight gain. Why can’t you just put the ramekin directly onto the bottom of the slow cooker pot? Because it might burn/ over-cook. This might be a stupid question but instead of using the foil to buffer between to ramiken’s and the crockpot would a crock pot liner work or is that not enough space between? Ever since I learned to use them for my cheesecakes I’m obsessed! I don’t have a torch but just the custard would be awesome. PLEASE develop recipes for slow cookers. I picked up this one and it is perfect for small meals. I don’t have a torch either, I’m wondering if an Aim N Flame would work instead. They sell for only a couple of dollars at most grocery stores and dollar stores. Thank you so much for this recipe – It’s a keeper. I tried it out today. I doubled the recipe and distributed the mixture among 6 ramekins. My family loved it! Did you adjust cooking time? Can’t wait to try this! I have an older Crock pot with a narrow bottom. Can I stack the ramakens? Also can I use a long wand butane BBQ lighter to crust finish or do I need to spend money on a gas block finished? Oh gosh, I wouldn’t stack them. They need to be sitting in water. Your crockpot won’t fit 2 ramekins side-by-side, or are you scaling the recipe up? Don’t use a butane torch; it’s toxic. Use the oven broiler setting instead. I can’t wait to try this. However I do not have a torch. Is there another way to get the “crust” on top? Just came across your website and I’m in love with it. The fact that you also were able to write “brûlée” correctly makes me love it even more! You just forgot the accent on “crème” but it’s alright cause you did the hardest part of the job lol. Thanks for inspiring girl! this was just featured in a recent foodiecrush post on slow cooker recipes, where I would never have expected to find a desert! So thank you for devising this recipe as a slow cooker recipe, great idea! This looks amazing!!!!!! 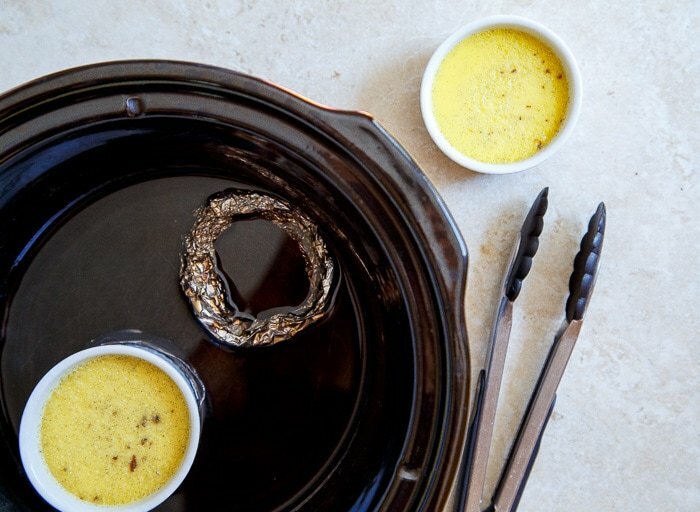 (Yep, I’m one of those people that put a zillion exclamation points after everything) Question: will the texture of the slow cooker crème brûlée differ from the texture of regular crème brûlée? Christina, I just discovered this recipe and hope to try it soon…brilliant idea! Also, I LOVE the humor in your posts (wiggle in the middle morning thought). I’m so glad I subscribed to your blog! Christina, I just discovered this recipe when reading about your S’mores Milkshake post…brilliant idea! Also, I LOVE the humor in your posts (wiggle in the middle morning thought). I’m so glad I subscribed to your blog! My favorite??????? ?,, I will definitely try this. Can I use a wire rack to set the dish instead of the foil paper? Can I put these on the metal rack in my crockpot instead of making the foil boats?